Wilson cables are used to connect your amplifier with antennas, splitters, and other accessories. Cables differ based on thickness, impedance, connector type, length, and sometimes color. Shorter and thicker cables are preferred to minimize signal loss. 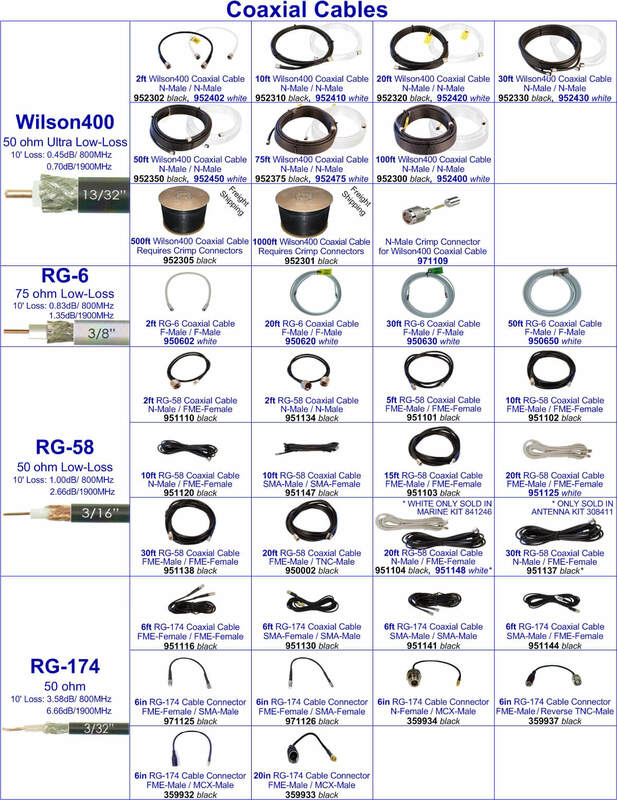 WILSON400 is our lowest loss, thickest cable, followed by RG-6, RG-58 and RG-174. Wilson400 (LMR400 equivalent) is our thickest cable. WILSON400 comes with N-Male connectors. This 13/32 inch thick cable has signal loss of 0.6dB per 10 feet. Different lengths and colors are available for easier residential and commercial installations. 500-foot and 1000-foot spools require separate N-Male crimp connectors and freight shipping. Cables offered are 2-feet (952302, 952402), 10-feet (952310, 952410), 20-feet (952320, 952420), 30-feet (952330, 952430), 50-feet (952350, 952450), 75-feet (952375, 952475), 100-feet (952300, 952400), 500-feet (952305) and 1000-feet (952301). RG-6 (RG6, RG6/U or RG-6/U) is the second thickest cable offered. This cable is the type which is most common in households (mostly for cable/satellite TV). It comes with F-Male connectors. This cable is 3/8 inch thick and has a loss of 1.09dB per 10 foot. This cable is white comes in different lengths. These include 2-feet (950602), 20-feet (950620), 30-feet (950630) and 50-feet (950650). RG-58 (RG58, RG58/U or RG-58/U) is the second thinnest cable offered. It is 3/16 inches thick and has a loss of 1.68dB per 10 foot. It is available in black with one white option, connector types and lengths. Options include 2-feet (N-Male/FME-Female 951110, N-Male/N-Male 951134), 5-feet (FME-Male/FME-Female 951101), 15-feet (FME-Male/FME-Female 951103), 20-feet (FME-Male/FME-Female 951125, FME-Male/TNC Male 950002, black N-Male/FME-Female 951104) and 30-feet (FME-Male/FME-Female 951138). Available in the marine kit 841246 is a white 20-foot cable (N-Male/FME-Female 951148) and available in kit 308411 is a 30-foot cable (N-Male/FME-Female 951137). RG-174 (RG174, RG58/U or RG-174/U) is the thinnest cable offered by Wilson Electronics. The thinness of this cable allows for it to easily be fed from the roof of a car (where an antenna is) to inside the car through the door. It is only available in black and in very short lengths. It is offered in 6-feet (FME-Female/FME-Female 951116, SMA-Female/SMA-Male 951130, SMA-Male/SMA-Male 951141, SMA-Male/FME-Female 951144), 6-inches (FME-Female/SMA-Male 971125, FME-Female/SMA-Female 971126, N-Female/MCX-Male 359934, FME-Male/Reverse TNC-Male 359937, FME-Male/MCX-Male 359932) and 20-inches (FME-Male/MCX-Male 359933).